Kel from Melbourne Minor and her mini reviewers checked out Sovereign Hill's Winter Wonderlights for us last weekend and had a good ol' time! Here's their review. 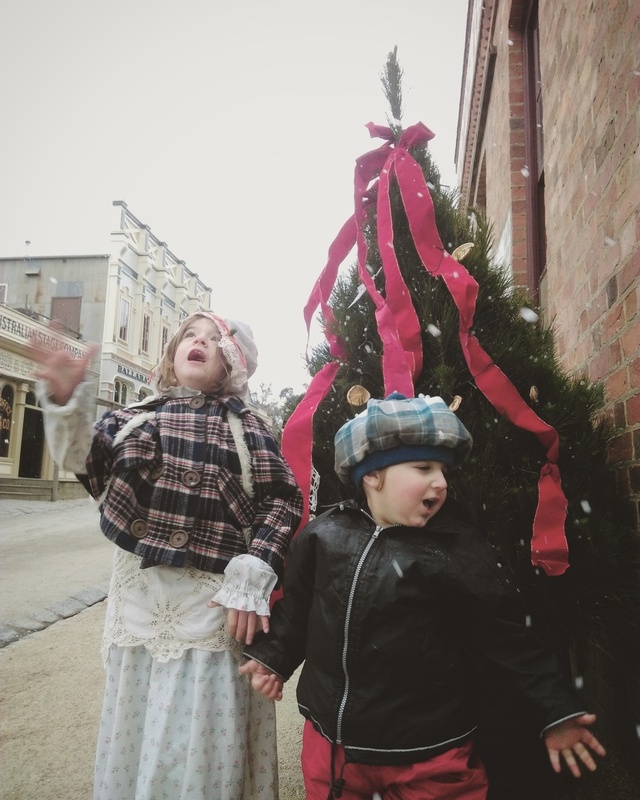 Sovereign Hill has just launched its Winter Wonderlights program and you know it's something special when people from all over the state are heading to Ballarat in sub zero weather to check it out! I hadn't been to Sovereign Hill with kids and was so excited to see it through their eyes. They were stoked to see four huge horses pull the cart around the corner as we entered and barely stopped smiling all day. If you've been to Sovereign Hill before you'll be happy to find all the classics are still there - the lolly shop with its famous Raspberry Drops, gold panning, the mine tours and poppet head, candle making and the march of the Red Coats. Winter Wonderlights brings the magic of Christmas in July in goldfields fashion with a sudden burst of White Nightesque spectacle to bring the evening to an impressive conclusion. The streets and houses are decorated with charming old world Christmas decorations and trees and there is a special performance program aimed at families. We were really impressed by the acrobats that put on a show at 12.30pm and the shadow puppet presentation came with a visit from St. Nick! Finishing off the day was the Jack and the Beanstallk Pantomime, perfect for warming up before the lights were switched on at dark. There are four snow falls each day that cover the main street in bubbly magic. Three during the day and one to coincide with the light show, the last one turning into rainbow snow under all those coloured lights! 1. Dress WARM! It really does get very cold and lots of the fun at Sovereign Hill is outdoors so everyone will have more fun under a few layers. The day we visited was 5* but 0* with wind chill factor. The kids were in snow gear so they were fine but otherwise would have been a bit miserable in those conditions I think. 2. One day is not enough to see everything so prioritise which demonstrations and performances you would like to see most. The Red coats and the Acrobats are the big ones to make note of times as both are one performance only. Other presentations include lolly making, gold pour, pantomime, candle making demonstration, shadow puppets, blacksmith demonstration and many more. 3. Gold panning is one of the quintessential Sovereign Hill experiences and plenty of fun. Be an optimist and grab a little bottle of water at the Waterloo Store on the way down to the creek to keep all your gold in and then grab a pan. There is always someone in costume to help you get the hang of it but if it's busy you may need to figure it out on your own. Gold is heavier than anything else in the creek so scoop from the bottom either with the shovel and your pan and use plenty of water to keep shaking the contents so the gold ends up right at the bottom of the pan. You will only be looking for specks, no nuggets left in here, but you should find at least a few at the base of the pan. 4. The best spot to grab lunch is the Hope Bakery. They have won plenty of prizes for their pies and there are cakes and custard tarts to keep them company. 5. Winter Wonderlights gets turned on at 5.45pm but Speedwell St is covered in fairy lights and is on from approximately 5.30pm. The best spot to view the switching on of the lights is right in the middle of Main Street near the Bank and New York Bakery. 6. Buying tickets online will save time. Also checkout their different packages, we are thinking about signing up for the membership because it is the same as two visits and the kids have definitely got two more visits in them! 7. Sovereign Hill has their own working post office so it's a good spot to write home from. 9. If you plan on spending two days there is accommodation on site and a Sound and Light Show (Different to the Winter Wonderlights). The Blood on the Southern Cross night show is great but I would only take older kids along to that one. 10. Buy the Raspberry Drops. Buy all the Raspberry Drops. So put on the thermals under the snow pants and go grab a mulled wine (yes, they are selling mulled wine :) ) and enjoy the lights! A whole lot has changed since your school trip visit back in the day! Sovereign Hill Winter Wonderlights will be running for an entire month from Saturday 25th of June to Sunday 24th of July. Checkout their website for more info.